June 22, 1965, Kenneth Goeden. 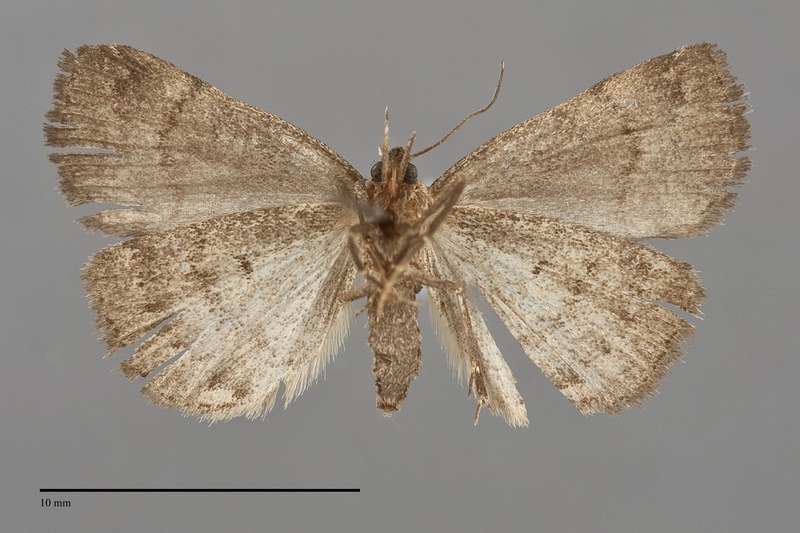 Phalaenostola hanhami is a small deltoid moth (FW length 11–12 mm) with dark gray to brown-gray forewings with a curved black reniform spot and an uneven pale subterminal line that has been collected once in western Oregon. 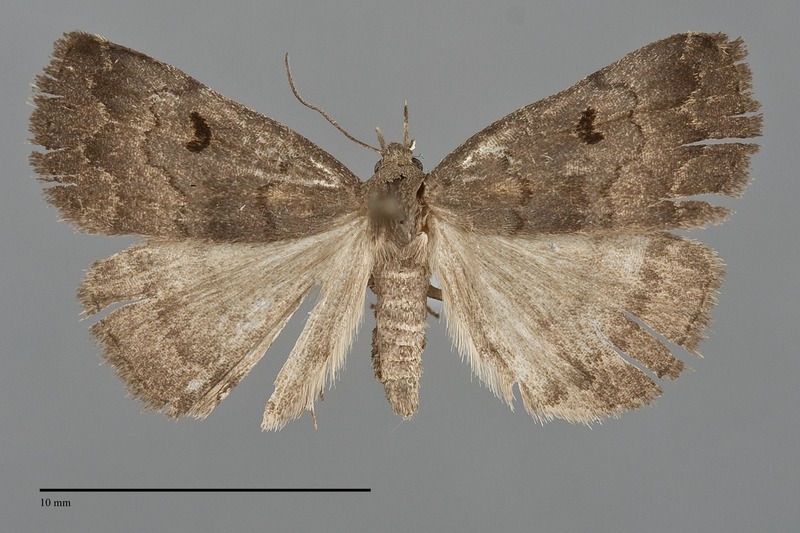 The forewing is shaped like a right triangle, like many other "deltoid" moths in related Erebid subfamilies. The ground color is lightly purplish dark gray to gray-brown, darker gray in the distal subterminal and terminal areas. A light brown spot is present in the antemedial area in the fold. The basal, antemedial, and postmedial lines are dark gray, slightly undulating, thick on the costa and thin elsewhere. The antemedial line is excurved toward the outer margin with a focal convex lateral segment on the mid-wing. The median line is dark gray, a diffuse dark area on the posterior wing. The postmedial line is undulating, bilobed toward the outer margin near the reniform spot, and curved below the spot to meet the trailing margin at a right angle. The subterminal line is pale, very uneven, and preceded by a dark shade. The terminal line is thin, dark. The fringe is concolorous with the terminal area. The reniform spot is filled with dark brownish black, C-shaped. The orbicular and claviform spots are absent. The hindwing is powdery light gray-brown, pale at the base and gradually darker toward the outer margin, with powdery dark wide postmedial and submarginal lines, and a thin terminal line. The hindwing fringe matches the terminal area. The palpus is moderately long. The head and thorax are purplish brown. The male antenna is bipectinate. This species can be identified by the combination of the dark purplish brown color, the black-filled reniform spot, and the uneven subterminal line. Both other moths with similar dark reniform spots, Zanclognatha jacchusalis and Bleptina caradrinalis, have straight subterminal lines. The habitat of this species in the Northwest is unknown. The only verified record of this moth for our region is from the Willamette Valley in western Oregon. Another record is shown for southwestern British Columbia on the Moth Photographers Group web site. It is possible that the Oregon record represents an introduction from outside our area. The range of this species extends to the Atlantic Ocean. It is found from central Alberta through the Great Lakes region to southern New England. The range is broadest on the eastern Great Plains where it has been found south to Oklahoma. The larva is unknown, but probably feeds on detritus such as dead leaves like many related species. This moth flies during the summer from June to August across its entire range. Specimens from the west have been collected during July and August. It is nocturnal and comes to lights.